Radiance Facial Scrub. Restore Zen to stressed skin. Biodegradable jojoba spheres. English Lavender hydrosol (so cooling). Castor bean lifts and releases grime. Face stays smooth and supple. Naturally pH balanced. Radiance without redness. Tested on friends. (Never animals). Vegetarian, vegan friendly and non-comedogenic. Each 50ml bottle provides a 3-6 month supply. Use once or twice weekly. Pump a tiny dab into your palm, blend with a few drops of water. Massage onto your face with delicate circular movements. Splash off with water or wipe with a damp muslin. Quick spritz with Drench skin tonic (to get your dose of aloe, MSM and Hyaluronic Acid). Radiance is lovingly hand-crafted by Wendy in her Devon studio. Finally a “scrub/polish” that doesn’t feel like it’s leaving scratch marks on your face. It buffs just enough to feel like you’ve scrubbed away the grime. I love the consistency, scent and feel. I use it twice a week followed by Drench and Empress Elixir. To confirm it all, I saw a friend yesterday who I hadn’t seen for an age and she said how wonderful my skin looked – “Hoorah!” someone has noticed. A rich and creamy exfoliating cleanser that works a treat on sensitive skin like mine. It feels very silky and luxurious. A single pump was enough to thoroughly exfoliate my face and neck. The tiny jojoba spheres are barely detectable but do a great job of whisking away dry patches and leaving my skin soft and glowing. I have seen a real improvement in my skin tone, which has been struggling a bit under the onslaught of colder weather and my January detox. 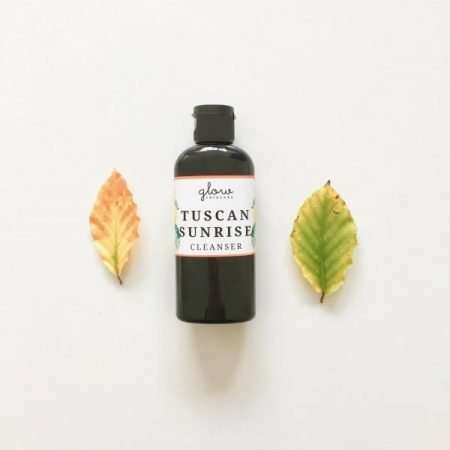 With super-fresh organic ingredients, this luxe product is well worth the investment to get a really effective but gentle exfoliating cleanser crammed with organic goodness. WARNING: once you start using Glow skincare products, nothing else will do. I started with the essential collection to give it a fair shot, and the results have been astounding. My skin doesn\’t just look healthy, it is healthy… these products are truly healing. My complexion has come alive, and I can only think this living glow is what Glow must have been named for. I didn’t order my next round soon enough… had to use some of my old products (all high-end, quality brands mind you) as I waited for the shipment to arrive… it was shocking to me to experience the difference. My old products felt like rubbing sludge on my face!! Let\’s just say I’ll make sure I never run out again. Thank you Wendy, you are an artist and your work is life changing.